Various versions of this quote have been attributed to an ancient Chinese Proverb, Ben Franklin, Eleanor Roosevelt, and John F. Kennedy. According to Phrases.org.uk, the phrase first appeared in print in a book of sermons by an English clergyman. But denunciatory rhetoric is so much easier and cheaper than good works, and proves a popular temptation. 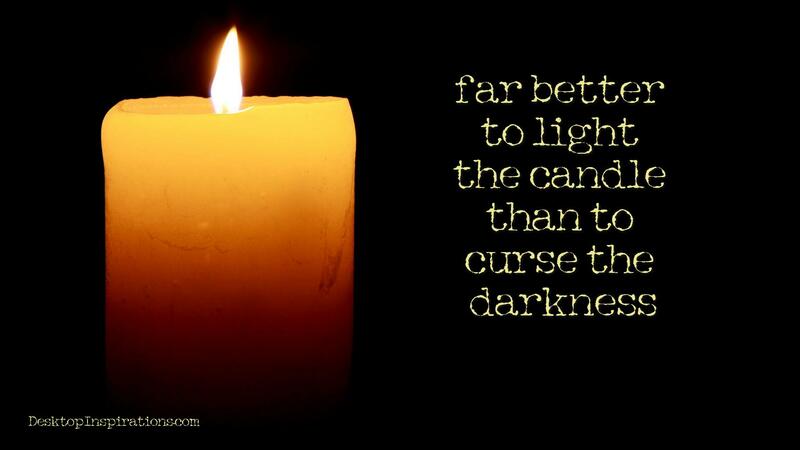 Yet is it far better to light the candle than to curse the darkness.” – See the source. No matter what its origin, it is sound wisdom. Cursing and complaining don’t fix anything. It’s only by taking action that we can make the world a better place. 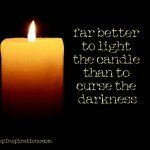 Far better to light the candle than to curse the darkness.